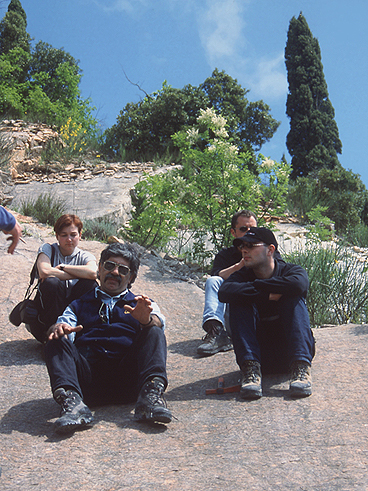 Morning break of the 2002 "impact stratigraphy" short-course participants in Coldigioco, a small village near Frontale/Apiro that hosts the "Osservatorio Geologico di Coldigioco", prior to departure to the field. View from Coldigioco towards Monte San Vicino to the west. The latter forms the core of a synclinal and is built of the upper Jurassic Diaspri and the lower Cretaceous Maiolica Formations. 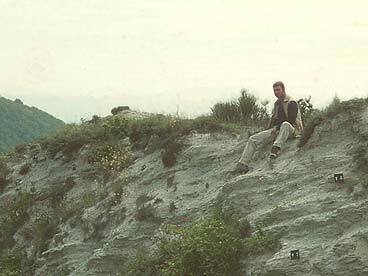 The Late Cretaceous/Paleogene Scaglia Rossa is exposed at the foot of the mountains. 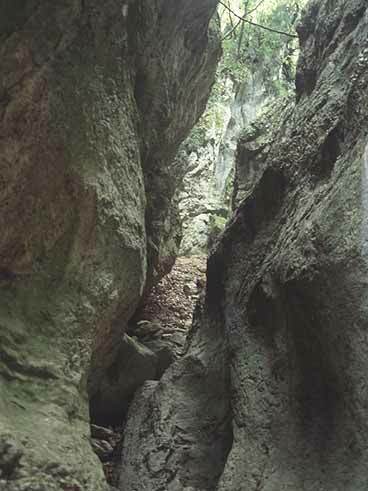 Deeply cutted gorge within the Maiolica dolomites in the Pian dell'Elmo resort, below the Monte San Vicente. 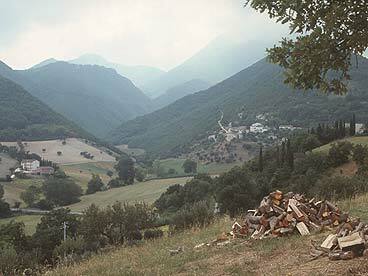 Coldigioco - "Plaza Italia": View from the old houses of Coldigioco across terraces of post-orogenic deposits of the Appenines towards the medieval tower of San Severino. 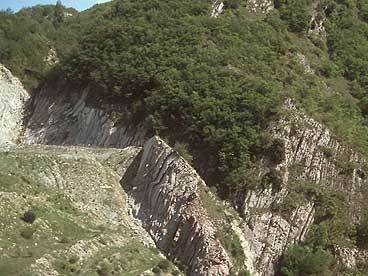 The Frontale quarry near Frontale, east of Monte San Vicino. The KT boundary at Frontale was subjected to slumping and synsedimentary faulting and moreover difficult to approach at the quarry walls. 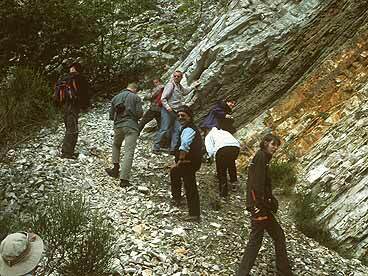 In a small quarry at the eastern end of the Frontale outcrop the KT boundary is downfaulted and easily to access. 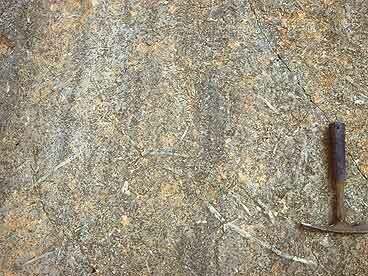 The bleached uppermost Cretaceous is biotubated with abundant Zoophycos and Planolites trace fossils. 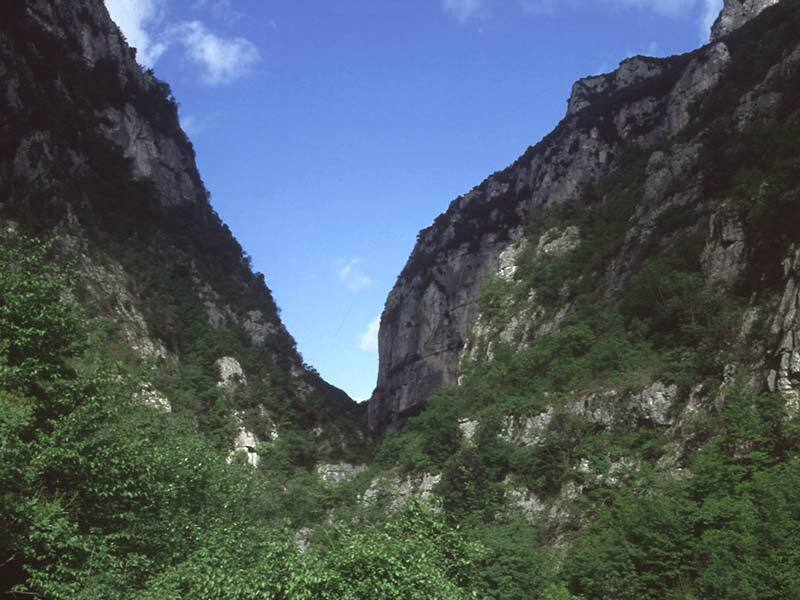 The large gorge near Frassassi (Umbria) is cut into the massive limestones of the Maiolica Formation (the unmetamorphosed equivalent of the Carrara marbles in Tuscany). The Maiolica is strongly karstified. Speleothemes within the Frassassi cave, the entrance of which is situated at the core of the anticline. 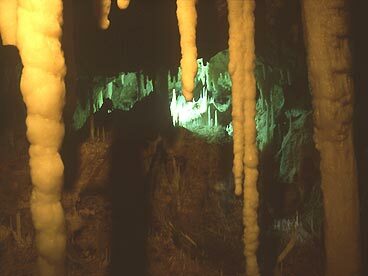 The cave is nowadays a famous tourist attraction. 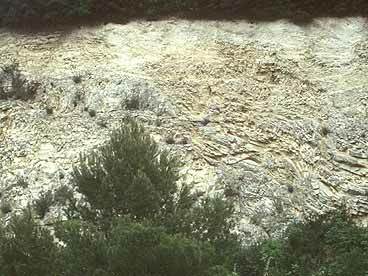 The spectacular outcrop in the large quarry in the Contessa valley near Gubbio (Umbria) is representing an almost complete record from the Upper Jurassic (Maiolica) through lower Paleogene (Scaglia Rossa). 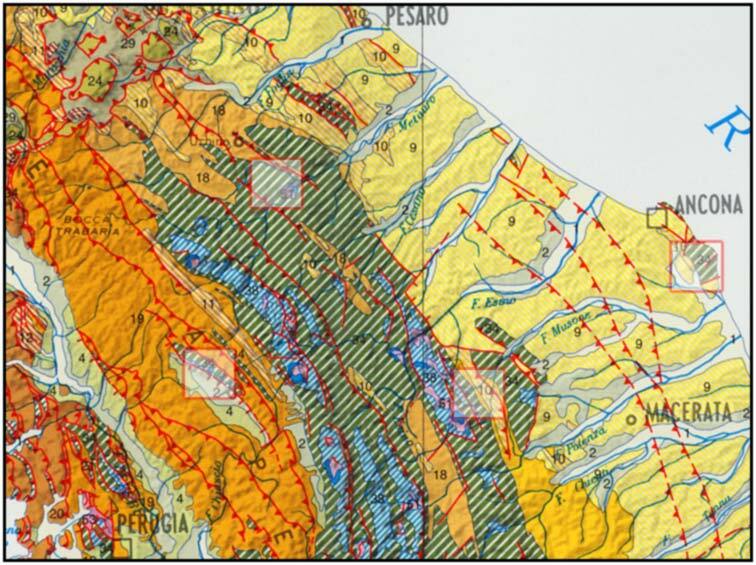 Note the synsedimentary fault within the Upper Maiolica, and the black shale of the Aptian anoxic event that are overlain by the Mame a Fucoidi Formation. 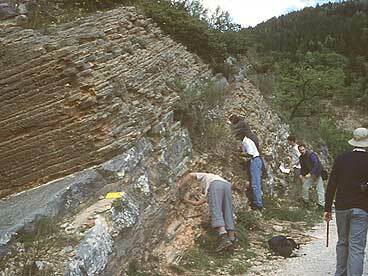 Upper (eastern) quarry wall with the pelagic succession of the Eocene/Oligocene Scaglia Variegata y Scaglia Cinerea Formations, overlying the Scaglia Rossa. Note the continuity of pelagic limestones even throughout the Paleogene. 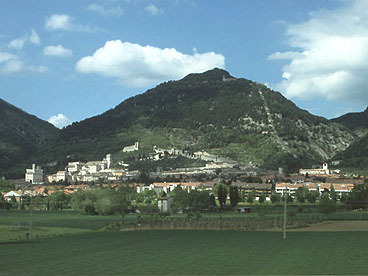 The medieval town of Gubbio with the Bottacione valley to the right and the Contessa valley to the left. 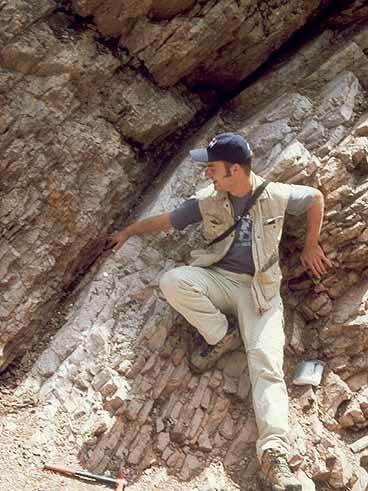 Sandro Montanari, head of the Coldigioco Observatory, at the classical KT locality Gubbio Bottaccione, where Walter Alvarez first found the Iridium anomaly within the KT boundary clay and deduced the hypothesis that a large meteorite impact caused the end-Cretaceous mass extinction. 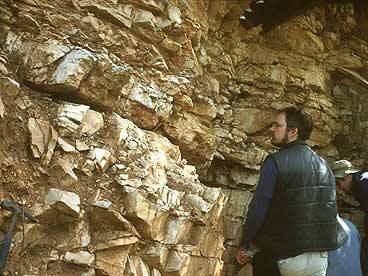 Myself at Gubbio Bottacione pointing towards the thin KT clay layer. 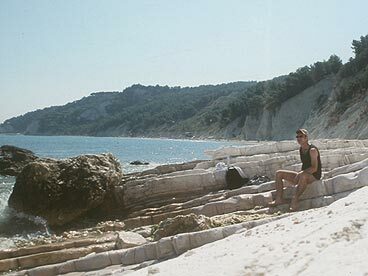 The top of the Cretaceous limestones was probably bleached during an brief anoxia event caused by organic rich bottom waters at the KT boundary which is regarded as an indirect evidence of mass killing of marine plankton. View from the road to Furlo near Urbino (Marche) towards the easternmoist anticlinal structure of the Umbria-Marche Appenines of Monte Paganuccio - Monte Pietralata. 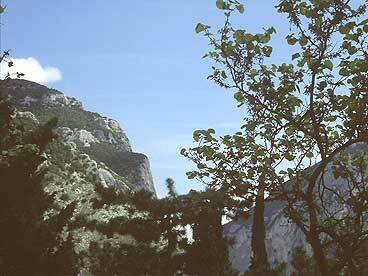 The contour of the rock formations just below the cloud are called "Face of Mussolini". 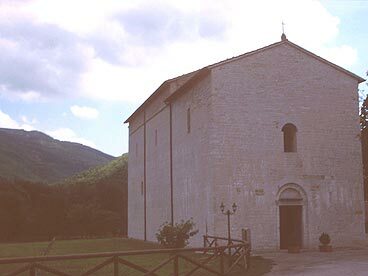 The medieval church 'Pietralata' near Furlo is a simple building with nice frescos in the interior. The hills in the background are built of Early Cretaceous to Paleogene limestones and marls. Panoramic view of the Scaglia Rossa at the Furlo quarry. 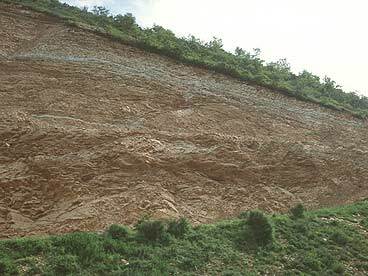 The succession is Campanian/Maastrichtian in age, the KT boundary is not exposed within the quarry itselfes. 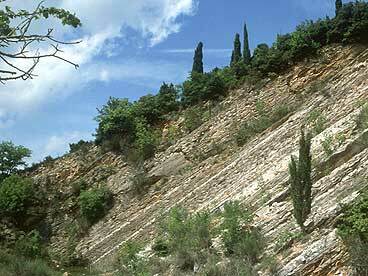 Different from the Gubbio area, it is composed of alternating reddish oxidized pelagic limestones and white turbidites. Group foto within the quarry. Slumping and the deposition in this part of the basin was induced by differential uplifting of individual structural blocks along reactivated fault sytems since the Turonian. 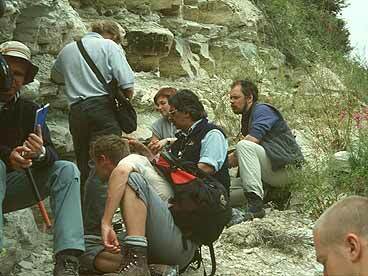 In the background the so called 'Triple T' event in the lower Maastrichtian. 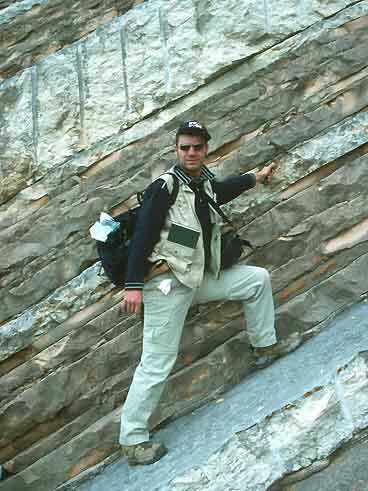 Sandro atop an undulating bedding plane of red pelagic limestone, just below the lowermost of the three turbidite beds that marks the base of the Maastrichtian stage. The 'Triple T' is a very good example of different time-scales in sedimentary successions: While the pelagic limestones are deposited by suspension during years or thousands of years, the individual turbidite beds form within minutes to hours. 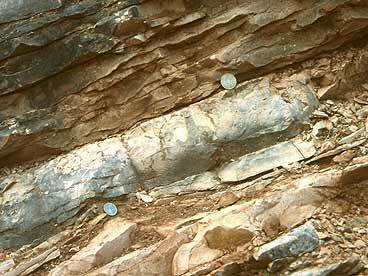 Detail of the bedding plane from the foto above: Abundant fossils and trace fossils, especially Thalassinoides isp., that became preserved by the overriding turbidite. 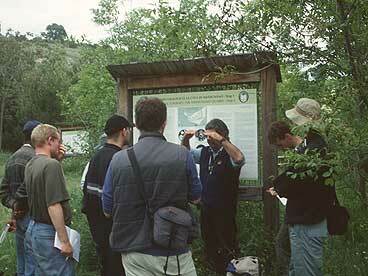 Studying the KT boundary section at the road cut near the Pietralata church (see above). 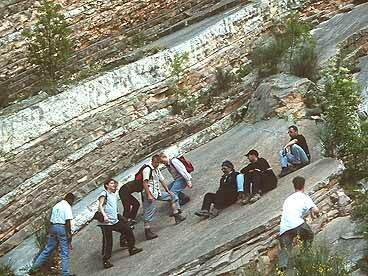 Again, there are turbidite beds present within the Scaglia Rossa above and below the boundary. 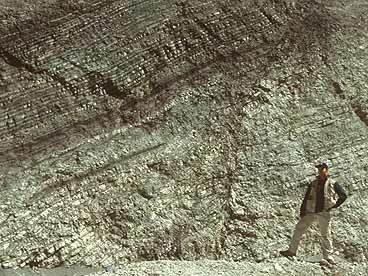 Bleaching of the uppermost Cretaceous just below the KT boundary (upper coin) is not as strong as at Gubbio. 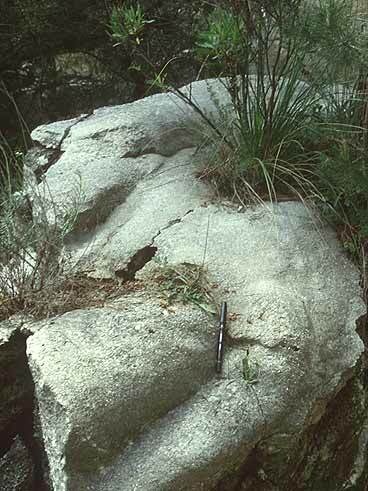 The Cretaceous limestones are heavily bioturbated and homogenized and/or do contain burrow or even large trace fossils as Planolites or Zoophycos (lower coin). 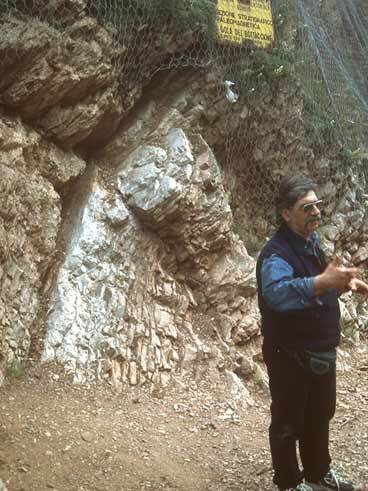 At the Furlo Upper Road Cut, the transition between the Scaglia Blanca and Scaglia Rossa is preserved that contains the black shales of the anoxic Bonarelli event at the Cenomanian/Turonian (CT) boundary. 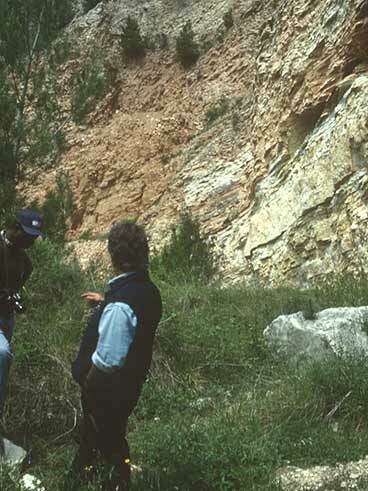 The Scaglia Rossa within the Fornaci Quarry near Poggio (S of Ancona). Similar as in the northern area (Furlo) the succession contains turbidetes that are correlacionable over large distnces. Just behind Sandro the thick 'Mega T' (or Marchesini Level) in the lower Paleocene (P1b zone) is exposed. However, the turbidites are coarse, clast supported breccias of fossil frgaments (grainstones). They are channelized, often display flute casts at their base, and are interpreted to represent more proximal deposits then the typical Bouma turbidites near Furlo. 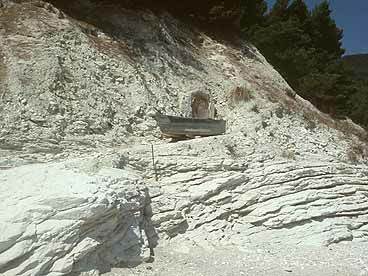 The Quagliotti Quarry near Fonte d'Olio, close to the road to the Hotel Monte Conero withoin the natural resort, exhibits a completely white, unoxidized variety of the 'Scaglia Rossa'. 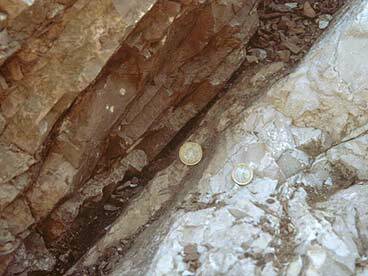 At the southeastern quarry wall the Scaglia Rossa is heavily slumped and cutted by faults. The KT boundary and the overlying 'Mega T' turbidite is displaced and not accessible. 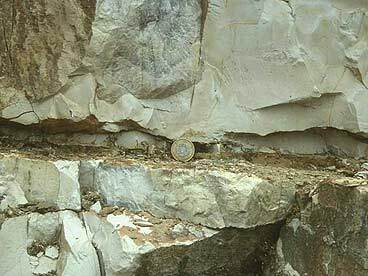 In the northeastern quarry the KT boundary is easily accessible and situated just 80 cm below the thick 'Mega T' turbidite bed (just at Teemu's neck). Detail of the KT boundary layer. The clay is composed of a brownish and a green-ocre sublayer and contains with 10 ppb Ir the largest Iridium anomaly measured in the U-M basin. 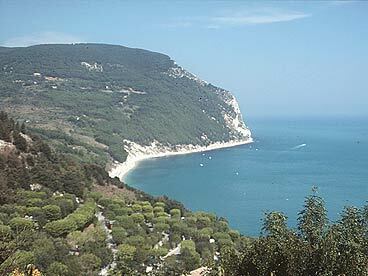 Panoramic view of the cliffs of the Monte Conero area at the Adriatic Sea. The rocks exposed along the northern tip of the Conero promontar belong to the Paleogene Scaglia Rossa and Scaglia Variegata Formations. 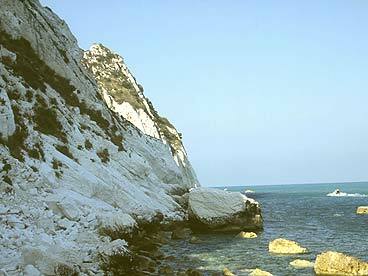 A small anticline within the limestones of he uper Scaglia Rossa directly at the coast. 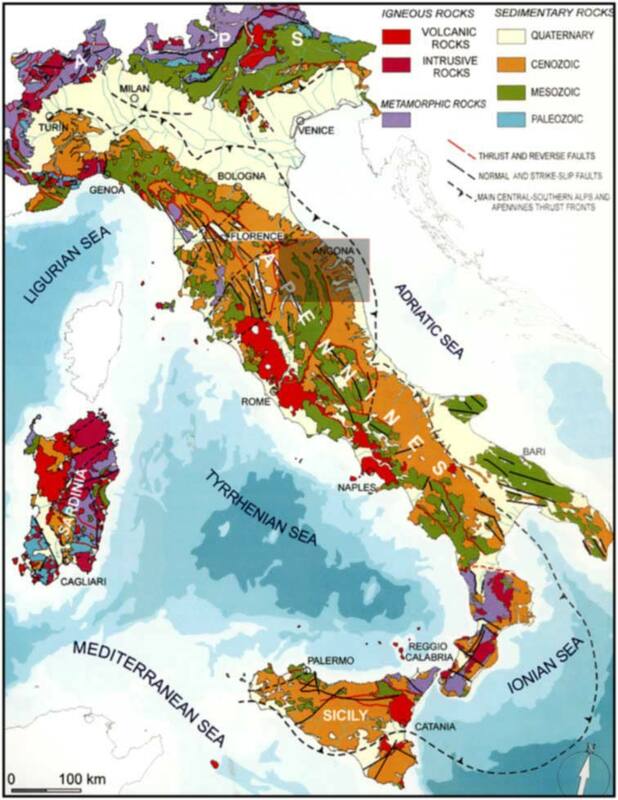 The lower Scaglia Rossa and the KT boundary is not exposed alog the coastline. 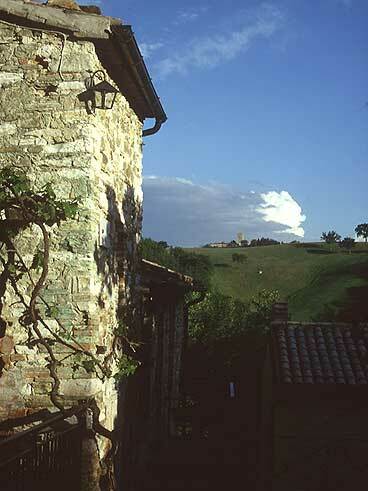 View southwards across the limestones of the gently dipping Scaglia Variegata limestones. 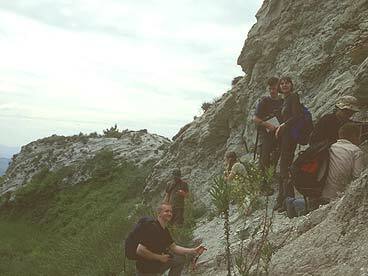 Due to faults, the Paleogene limestones forming the cliffs of Monte Conero are in part steeply inclined. North of the promontory the succession continues all the way up to the Miocene Schlier Formation. 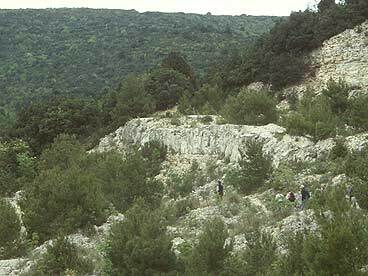 The quarry of the Scaglia Cinerea Formation near Massignano is the official Global Stratotype Sectiona nd Point (GSSP) for the Eocene Oligocene boundary. At two levels within the Upper Eocene the marly limestones at Massignano contain impact signatures such as Ir anomalies, shocked quartz, Ni-rich spinel, and microspherules that are thought to represent distal ejecta of the Popigai and Chesepeake Bay impact structures. However, these signatures does not coincide with the Eocene-Oligocene boundary which is exposed 8 m above the second Ir peak, at the northwestern quarry wall. 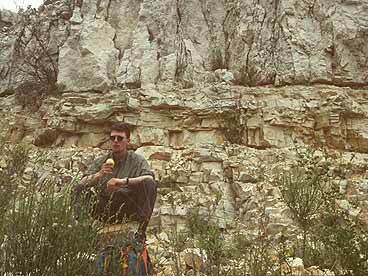 Sitting on Oligocene marls, just above the E/O boundary, which is located below my right feet. * The phrase "Ex Libro Lapidum Historia Mundi" is taken from the second chapter of Walter Alvarez' book "T.rex and the Crater of Doom" and from the logo of the "Osservatorio Geologico di Coldigioco" (OGC), Italy. With kind permission of Alessandro Montanari, OGC.